Wow, doesn’t time pass by so quickly? It seems unbelievable to me that I haven’t posted since May but what is even more unbelievable to me is that I hadn’t actually created anything during this time. There are many reasons as to why but I am hopeful they are all behind me for now. I have taken advantage of a few sales during this time and picked up some lovely new supplies. I am delighted to finally be able to share something new! When I first received the Lawn Fawn stamp set “Life is Good” I knew exactly what I wanted to do with it…and yet what I ended up with was quite different and I LOVE it. lol Funny how this happens! 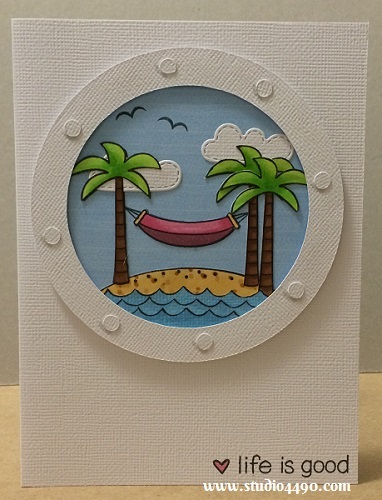 I started by creating the little scene (we all know how much I love scenes) and then it crossed my mind how fun it would be to be looking out a porthole and coming across an island paradise. I jumped onto the Silhouette store and found a cute porthole shape and from there the idea began to come alive. Materials Used: Stamps – Life is Good (Lawn Fawn); Lawn Cuts – Spring Showers (Lawn Fawn); Die – Porthole (Silhouette); Patterned Paper – Unknown; Copic Markers; Distress Ink; and Glossy Accents. You might have noticed that there isn’t a greeting – I’ll add this when I send the card because I am not sure how or when I will use it at this stage. I loved this idea so much that I went on to create another two versions. There are only a few differences and I have to say I love each look. 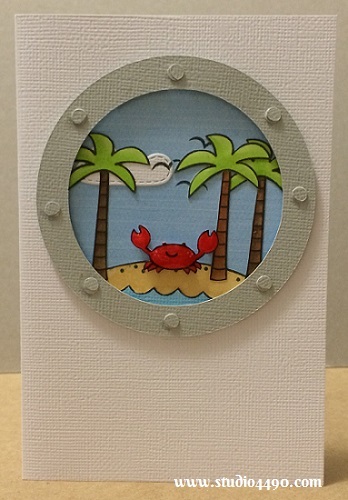 Here’s card two…I used grey cardstock for the porthole and I also popped it up. The basic scene is the same. 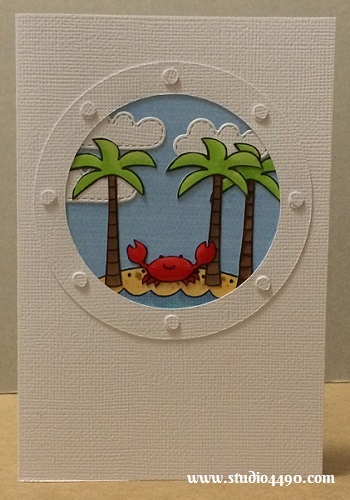 Here’s card three…I used a much larger porthole, popped it up, used a hammock instead of the crab and also added a sentiment. Materials Used: Stamps – Life is Good (Lawn Fawn); Lawn Cuts – Spring Showers (Lawn Fawn); Die – Porthole (Silhouette); Patterned Paper – Unknown; Copic Markers; Distress Ink; and Wink of Stella – Clear. Ahhh, it is soooo good to be creating again! Oh C, I can totally relate. It’s okay! Thank you soooo much for your lovely words. You know they mean the world to me. You and Bev always know about the best challenges. How do you keep up? Hope you have a FANTASTIC time with the family. YAY!!! hugs!! Bev, you made me smile from ear to ear. Thank you soo much. It is nice to be missed. I will see if I can find that challenge you mention too. I’ve missed you too, by the way. hugs!! Ooh, I love all three! What a clever idea to make it look like a port hole. I wish I’d thought of that first! 😀 Of the three, I think the middle one is my favorite. There’s just something about the contrast between the gray and the white that makes everything pop. It’s got a birthday message (bonus!) and lots of arrows. lol Thanks so much, Elle! 🙂 I think I agree with you. It definitely needed that bit of pop and definition. Thanks for the tip about the Avery Elle stamp set, I will check it out. 🙂 And, THANK YOU, that made me feel super good. hugs!